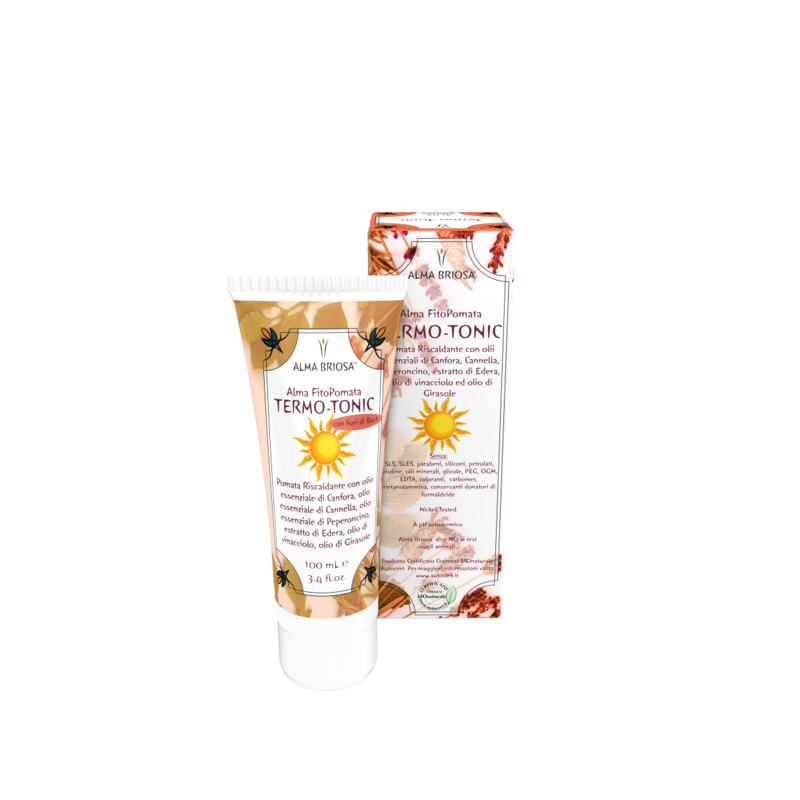 Termo-Tonic is the ointment that helps to stimulate microcirculation, providing a pleasant warming effect. The cream contains essential oils of Camphor, Cinnamon and Capsicum: they have a rubefacient action, which, in addition to the stimulating of circulation, provides a pleasant thermal effect on the area of application. The ointment contains a floritherapic mixture, prepared with Dr. Bach’s methodology. It serves to alleviate emotional and psychosomatic uneasiness. The action of herbal extracts mixed with Dr. Bach’s remedies resolves both physical and emotional imbalances. Floritherapic mixture used: Clematis, Hornbeam, Larch, Vervain, Walnut, Willow. Use: apply and massage a thin layer of cream where a heating action is required. Use before and after sport activities: to warm up muscles before, and to help relieve accumulated muscular tension after. The product can be used to warm up cold hands and feet. Bach Flowers	 Clematis, Hornbeam, Larch, Vervain, Walnut, Willow. INCI	 INGREDIENTI/INGREDIENTS: Aqua**, Vitis Vinifera (Grape) Seed Oil**, Decyl Oleate**, Glycerin**, Cetearyl Alcohol**, Sodium Cetearyl Sulfate, Cinnamomum Camphora (Camphor) Bark Oil**, Helianthus Annuus (Sunflower) Seed Oil**, Capsicum Annuum Extract**, Cinnamomum Zeylanicum Bark Oil**, Clematis Vitalba (Clematis) Flower Extract**, Carpinus Betulus (Hornbeam) Flower Extract**, Larix Decidua (Larch) Flower Extract**, Verbena Officinalis (Vervain) Flower Extract**, Juglans Regia (Walnut) Flower Extract**, Salix Alba (Willow) Flower Extract**, Benzyl Alcohol, Methyl Nicotinate, Potassium Sorbate, Eugenol**, Benzyl Benzoate, Cinnamal**, Linalool**.